One of the most common questions asked of a physical therapist is, "How high should I adjust my cane?" Walking with a cane that is too short or too tall can be difficult, and it can put you at risk for falling or for injury. Ensuring your cane is adjusted properly can keep you safe and make walking an easy and safe task. If you are having a problem walking or moving about, you may need an assistive device to help you safely get around. 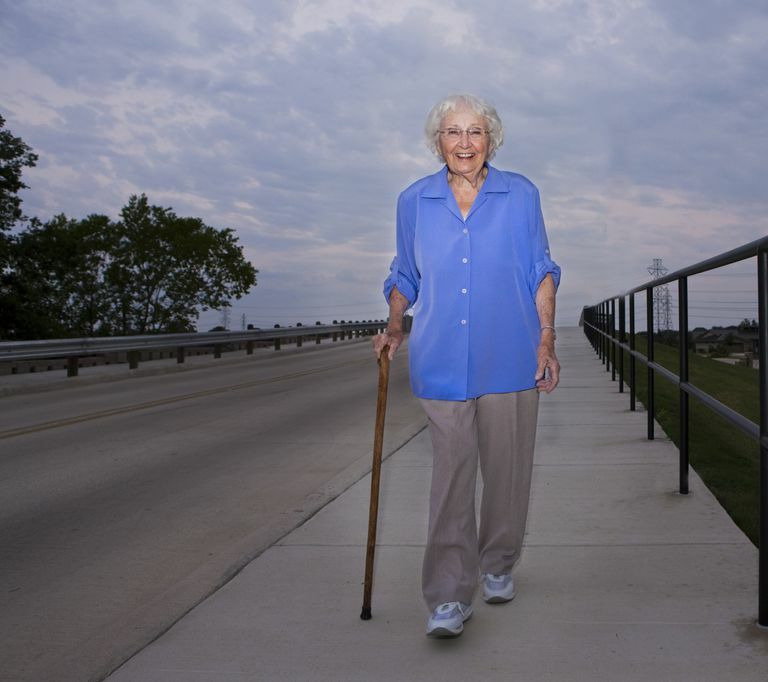 Devices such as walkers, crutches, and canes are available to help you walk better and decrease your risk of falling. A straight cane is a device that you can use after injury or illness to help you improve your ability to walk. It provides support to help you keep your balance while walking. While a cane can be an effective device to help you walk better, it works best when sized and adjusted properly. Canes are usually made out of wood or metal. Most metal canes are adjustable. Simply loosen the tension screw near the bottom and push the small button in on the side of the cane. You can then slide the metal parts of the cane to make your cane shorter or longer. Remember to make sure that the push button is fully engaged in a hole and that you tighten the tension screw once you are done. If your cane is wooden, you can make it shorter by cutting off the right amount on the bottom. Be careful not to cut too much off; you cannot make a wooden cane longer. A good rule to follow is "measure twice, cut once." But how high should you make your cane? Follow these steps to make sure your cane is fitted properly. You should always consult your physical therapist or doctor to make sure that your cane is right for your specific condition. While standing, hold your cane in one hand and let the tip of the cane rest on the floor. Typically, you should hold your cane on the side of your body opposite your injury. For example, if you have left knee pain, hold the cane in your right hand. When holding the handle of the cane, the cane should come to the level of your hip bone on the side of your upper thigh. When you grab the handle of your cane, your elbow should be bent approximately 20 degrees. A visit to a physical therapist may be in order so he or she can use a goniometer to measure your elbow position to ensure it is correct. An alternative way to measure your cane height is to stand with the cane at your side. The top of the cane should be at the level of your wrist when your arm is hanging comfortably at your side. Remember, your doctor or physical therapist should check to make sure that your cane is sized properly and that you are using your cane correctly when walking. Your physical therapist can also work with you to help improve the way you walk. Hip and leg strengthening exercises can be done, and your PT can prescribe balance exercises to help improve your balance and proprioception. Your physical therapist can also show you common mistakes to avoid when using a cane. Sizing your cane improperly can be detrimental to your overall functional mobility and safety. If your cane is too long, it won't provide the needed support for your while walking. If it is too small, it may cause you to have a forward-bent posture. This may cause back pain and it may bring your center of mass forward, leading to loss of balance and falls. So be sure to take some time to size your cane correctly. Finding the proper cane height is easy to do if you follow these simple instructions. If you walk with a cane, check in with your physical therapist to make sure your cane is the proper height and that you are using it properly. Walking with a cane should feel natural an easy if you have taken the time to make sure it is the proper height and that you use the device the right way. And if you fail to size your cane properly, it can make walking difficult and may set you up for an injury due to a fall. Liu, H. H., Eaves, J., Wang, W., Womack, J., & Bullock, P. (2011). Assessment of canes used by older adults in senior living communities. Archives of gerontology and geriatrics, 52(3), 299-303.